Well hello party nails! 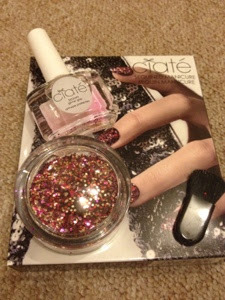 The Ciate sequin manicure is possibly the most 'bling' nail effect i've seen so far; perfect for the Christmas party season. The sequin manicure comes in a kit that contains 'glitter grip' - a clear coat, a pot of multi coloured mini sequins and a little brush to help you remove any excess. There are three colour ways available at the moment, I purchased Tutu, a blend of pink, purple and gold sequins. I found it really simple to use. First you apply a coat of the glitter grip and allow it to dry. 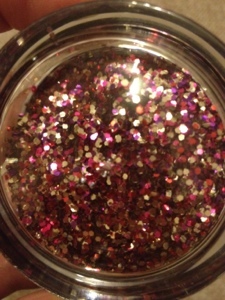 Then taking one nail at a time, apply another coat and dip your nail into the pot of sequins. Push them down onto your nail and using the brush, remove any excess from the sides. You then apply another coat of glitter grip over the top to seal them in. I found that I had to wait about 40 minutes before my nails were totally dry, so you do need a bit of patience. I also applied two coats of glitter grip over the sequins to try to help them stay on as long as possible. It was a bit messy (ok, a lot messy), but as long as you put down some paper to do the application on, you should minimize the distance the sequins travel across the carpet! I had mine on for 3 days and there was only some minor wear to the tips. I did them for my Christmas party and got lots of compliments on how lovely they looked. Removing them was also rather tricky, but 10 minutes using the 'foil method' soaked them off without too much effort. At the moment, I believe you can only purchase these from Selfridges, for £14 a set. I think it's well worth it. The pot of sequins is enough for many applications, so this is something you can use over and over again. 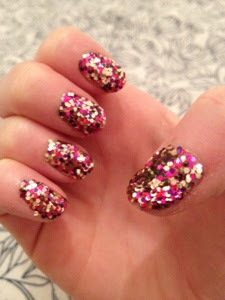 I'll definitely be repeating my sequin manicure over Christmas! These looks so pretty!!! Gorgeous colours. I'm still in love with these, photographs never do beautiful glittery things justice, but these are amazing in real life! I love the colours :) so pretty. Still love these. They looked gorgeous in person too. Really need to hand my hands in this set! Definitely :) They are worth the trip! Definitely - they stay on a lot longer than caviar pearls too, bonus! 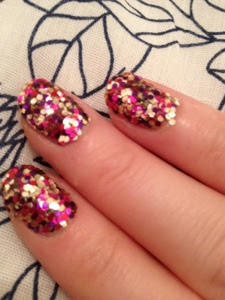 I love this - it looked so stunning on your nails on Saturday, proper sparkle sparkle! It definitely takes a bit of patience!